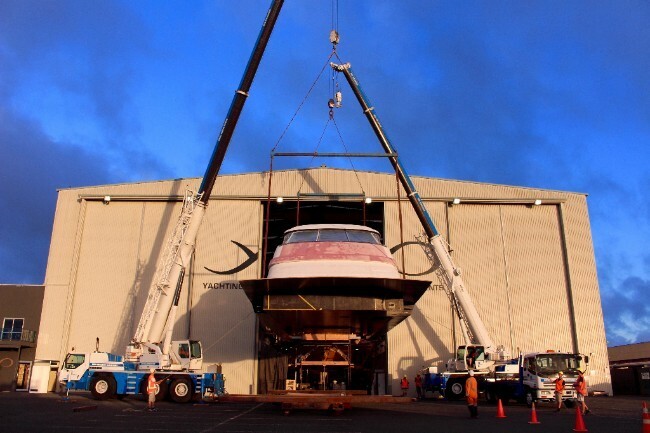 Hull 1015, the 38.7m sportsfisher in build at New Zealand yard Yachting Developments, is now entering its final stages of construction. On 8 April 2017 the yacht’s impressive superstructure left its construction bay before being returned to the shed to be joined to the hull and for completion work. This huge motor yacht, being built for a passionate fisherman and experienced yacht owner, is on a scale never seen before in sportsfishers and will be the largest all-carbon sportsfisher in the world on her delivery. Now in one complete part the sheer scale of this incredible yacht is fully apparent. Delivery for Hull 1015 is set for Q3 of 2017. Naval architecture and exterior design is by Michael Peters Yacht Design, with interior styling by the owners and the yard team. Interior work is being produced by Yachting Developments’ specialist in-house interior team, with structural engineering and design also by Yachting Developments.